Build brand relevance and align with consumers' passion points by running targeted pre-roll ads before videos your customers are watching. Your clips will run before video content from our 200+ brand-safe partners across 15 categories. What is an In-stream video? In-stream videos are advertisements played at the beginning of a video from one of our 200+ content partners. Click the play button on the video example to see an In-stream video views campaign run by Pizza Hut. Run pre-roll video content to align your brand with brand-safe, premium content - including highlights and other top video clips - that your customers are already watching. Build brand association by sponsoring the best video content from a single Amplify partner. Note: In-stream sponsorships are not currently available for self-serve advertisers. Maximum bid: this type allows greater control over how much you pay per video view. In this bid type you can choose exactly how much you are willing to pay for a video view (your maximum bid), and your results will not be charged over this price. This bid type is helpful for experienced advertisers who know exactly how much they’re looking to pay per video view at scale. Launch your In-stream video views campaign! Your in-stream video will automatically be matched with publisher content when you set your campaign live, respecting any excluded categories or @handles you specified during setup. Publisher content refers to Tweets with video from one of our 200+ content partners, or "publishers". If a user on Twitter views a Tweet that your in-stream video has been paired with, they might be shown your in-stream video if they also fit the targeting criteria you specified during setup. If a user views the publisher Tweet but does not fit your targeting criteria, they will not be shown your in-stream video ad. In your Ads manager you'll be able to see the results of your In-stream video views campaigns. Filter the date range in the top right corner to see key metrics such as total spend, results, cost per result, and result rate. Your "result" will be either in-stream video ad views or 3s/100% in-stream video ad views, depending on what you chose during campaign setup. An in-stream video ad view is when your video is watched in 50% view for 2 seconds or more, or when a user clicks to expand/unmute your video. A 3s/100% in-stream video ad view is when your video is watched in 100% view for 3 seconds or more, or when a user expands or unmutes your video. When filtering to the "Ads" level, make sure to choose the In-stream videos button to view your in-stream view results (pictured right). 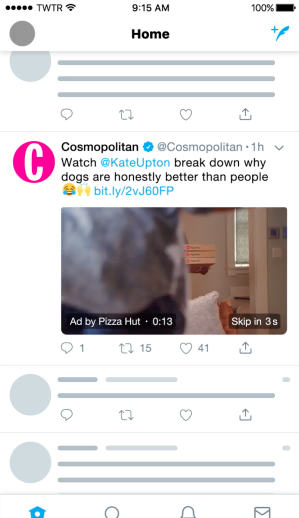 The Tweets button will show view metrics from the publisher content videos your ads ran before. Why and when should I use an In-stream video views campaign? In-stream video ads allow you to extend the reach of your video ad campaigns and connect with what your audience is talking about. In this campaign objective your videos run as pre-roll ads before brand-safe videos from 200+ premium publishers, including major sports leagues, top TV shows and networks, major publishing houses, and professional news outlets. With so many world-class video publishers on Twitter, in-stream ads are perfect to borrow brand equity from the publisher whose content your videos run before. If you're looking to generate brand lift with your video content, this objective is for you. You can build brand relevance and align with customers' passion points by running targeted pre-roll video ads before content they're already watching. There's no Tweet copy needed, just upload your pre-roll video directly into the campaign form to get started running in-stream video ads. How much do In-stream video views campaigns cost? When you run an In-stream video views campaign, you will only be charged for the in-stream video views (either standard in-stream video ad view or 3s/100% in-stream video ad view) you acquire from that campaign. Impressions that don't result in an in-stream video view are free. The cost you pay per in-stream video view in your campaign will depend on the budget and bid you set for your campaign, as well as the targeting you select. You'll receive real time bid guiddance based on your targeting in your campaign setup. More on Twitter Ads pricing. When setting up your In-stream video views campaign you can select between automatic or maximum bidding as your bid type. We suggest selecting the automatic bid option since this automatically bids on your behalf, maximizing your campaign's chance of serve. If you choose maximum bid when you setup your campaign and input your bid, think of your max bid as how much you're willing to pay per in-stream video view. Remember, an in-stream video ad view is when your in-stream video is watched in 50% view for 2 seconds or more, or when a user clicks to expand/unmute your video. A 3s/100% in-stream view is when your in-stream video is watched in 100% view for 3 seconds or more, or when a user expands or unmutes your video. It's important to think carefully about the value each in-stream video view brings to your business. The recommended bid is a good indicator of the amount you will need to bid for your campaign to reach its goal. You will never be charged more than your bid and advertisers are often charged less. However, if your bid is not competitive relative to other advertisers, your campaign may not serve. What types of Tweets can I use in my In-stream video views campaigns? You will not use any Tweets in an In-stream video views campaign, but rather you'll attach a video directly in campaign setup. This video will be paired with publisher Tweets and play before them as a pre-roll video. If your video is longer than six seconds, the user will be able to tap to skip at :06. View our previews on the right of how your In-stream video will appear on the Publisher's Tweets. Use short-form video: To get your audience’s attention quickly on mobile, shorter ad lengths work best in achieving higher brand affinity. The ideal length is six seconds. Include your branding within the initial video frames: Video Ads create maximum impact when your brand is clearly identified within the first few frames — which is particularly important for content viewed on mobile devices. Communicate visually: Video Ads appear within a video stream, so it’s important to catch your audience's attention with strong visuals. Express your message without audio (or sound off). How do you determine that my videos will be matched with content that is brand-safe? We use a combination of technology, people resources, and serving controls to ensure that in-stream video ads only match with publisher content in compliance with our Safe for Ads content guidelines. You may opt out of specific content categories that you do not want your ads to pair with, as well as exclude individual publishers against whose content you do not want your in-stream videos to be paired with. All publisher partner content must comply with the policies outlined here. Your in-stream video ads must comply with our Twitter Ads policies. What partners are available for my in-stream video to be matched with? Globally, we’ve partnered with more than 200 of the best video publishers in the world, including top TV networks, teams from major sports leagues, and professional news outlets. In the United States, partners include - but are not limited to - Business Insider, CNN, Condé Nast Entertainment, Fox News, Fox Sports, Hearst Magazines Digital Media, IGN, Meredith Corporation, and Reuters. If you do not want your in-stream video to be paired with certain categories of publisher content or publisher video content, you can specify this on the Targeting page of campaign setup. You also have the option to exclude your videos from playing in front of specific @handles. To do this, enter the Targeting page of campaign setup and type in @handles under the "Excluded Twitter accounts" section. For a full list of our publisher partners please reach out to your account representative, this list is not available for self serve advertisers at this time.